Woo-hoo! Two new Apple toys to start the year with… we couldn’t be happier! These were purchased during a one day only Apple Online Store Sale on January 10th. 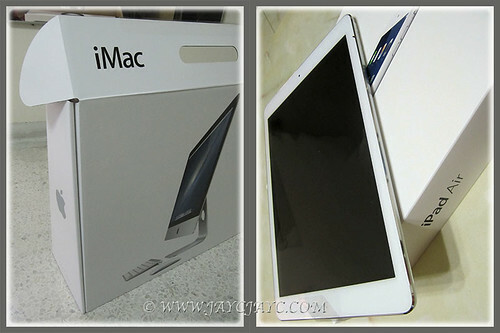 iMac 21.5-inch was delivered on January 15th, while iPad Air six days later. These new toys truly rock and kept us glued to our seats in amazement, so to speak. The sole purpose of getting an iPad was to encourage my beloved John to be computer literate… to know the basics of email messaging, able to navigate the internet to read the news and find useful info, enjoy songs/photos in our iTune and iPhoto libraries and loads of other interesting happenings in the cyber world and the likes. Hmm… took me more than a year to change his set ways and old school of thought. I’m mighty glad that he’s enjoying his new gift currently and learning fast too! I’m also new to iPad… thank goodness, we have our boys to teach and guide us along the way. The new iMac is awesome, love all the features therein. Super fast… this was the main reason that I had wanted to upgrade from my old 20-inch iMac, a mid-2007 model that was super slow for multitasking. 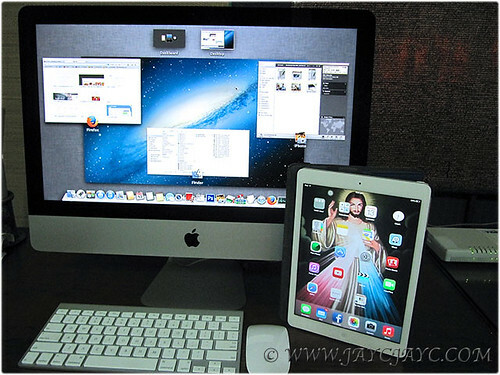 A big THANK YOU to my elder boy, David, for helping to set-up the newly-purchased Apple products. Set-up for both was a breeze for him but transferring my photos from the old iMac to new by myself during his long-weekend absence turned out to be disastrous. After spending endless hours in trying to retrieve my photos through help from Apple Support Communities and telephone support from Apple Care, I finally had to purchase Disk Drill – a Data Recovery software that cost me US$89 to recover the lost jpeg files. I’m so delighted to find that there’s a light at the end of the tunnel. Disk Drill truly came to my rescue, but I have a humongous task ahead. I’ve to delete slowly all the irrelevant photos (which included countless duplicates) from the recovered files that initially numbered more than 200K . Thank goodness, it’s already downsized to 9K with David’s professional help, though there are 4 thousand more to trash. The final count of original photos recovered need to be imported subsequently to my iPhoto library with some editing too – a very time-consuming process! Nevertheless, I’m so very happy now knowing that probably 95% of my missing photos can be retrieved. 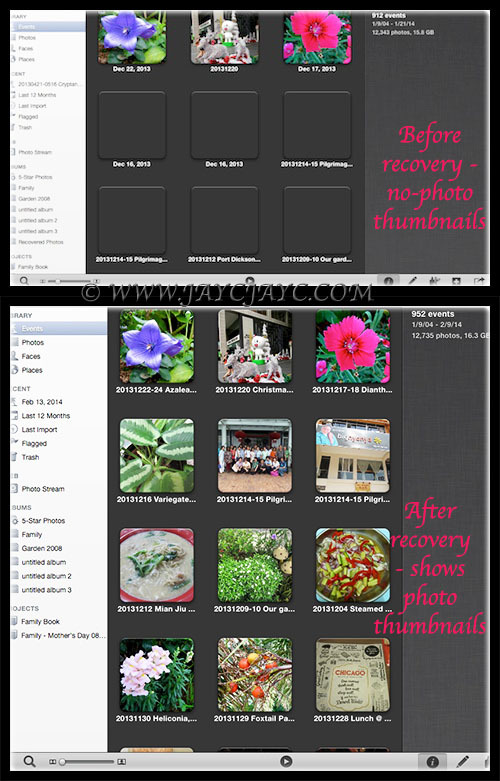 Currently, I’m still in the midst of replacing the empty-photo thumbnails gradually with the recovered jpeg images that need to be renumbered to match the original files in my iPhoto library. I’ve just completed retrieval of photos for 2013, yet to accomplish for 2012 and 2011. Though a humongous task ahead, I’m absolutely thrilled beyond description and look forward to completing my job the soonest possible. I’m sharing my harrowing experience here just in case someone out there is encountering similar problems and need a solution. When all else failed, Disk Drill came to my rescue and in my humble opinion, its recovery software is worth every penny spent to retrieve my precious lost treasures. Much thanks to Disk Drill! A big THANK YOU too to Ms. Emily of Apple Care Phone Support and LarryHN of Apple Support Communities for all assistance rendered. God bless you both. Thank goodness you could recover back the lost photos. Many many to sort is better than nothing! For my precious photos, I can’t imagine what kind of shock or attack I’ll get if they are lost, oh dear. I regularly back up in DVD besides storing them in external hard disk drives. Indeed, A.Belle… I’m overjoyed beyond words to be able to retrieve them. I’ve ceased backup of photos in DVD since using an external hard drive with my iMac in 2008… will definitely resume using DVD backups to be doubly certain there’s another backup elsewhere. Wouldn’t want a repeat of this disaster. Thanks for sharing your backup methods.